My listings include all vital information which you will find informative and cover most of your questions. Please take a minute to read everything. If you have questions, you can send me a message. 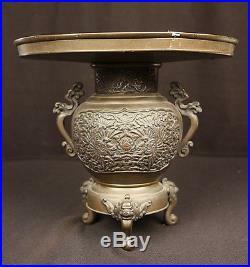 This is an antique Japanese usubata bronze vase, fresh from an old estate. This has cast relief decoration of dragons and shows a lot of hand work. This item measures about 11" in diameter, 10" tall and 6 1/2 wide. There is an old split to the rim of the liner, spotting from age, paint spots and surface scuffs. This weighs about 6 lb 5 oz before packing. I will be sending your item from San Diego, California 92116 USA. Larger items are usually sent by ground service. Package Express services are not available at all greyhound bus stations, so you do need to find out where your nearest Greyhound Package Express station is located. The larger and more fragile an item, the more it costs me to pack it properly. On expensive fragile items, we may need to double box them. This will require additional labor and material costs. I would rather pack your item properly to make sure that the item arrives intact, rather than to deal with a claim. EVERY ITEM IS GUARANTEED TO BE AS DESCRIBED. Every item I offer is guaranteed to be in as described condition, as written in my listings. I sell mostly antiques and collectibles, which will usually have the normal wear that you would expect to occur from normal use and age. You are guaranteed that there are no repairs, alterations, or damage, unless I specifically mention them in my condition report above. I SELL ONLY GENUINE ORIGINAL ITEMS. I do my very best to accurately represent each and every item I sell. I do not sell fakes or reproductions of any kind, unless they are clearly described as such. I guarantee every item I sell to be authentic, and to be made in the time period as represented. I welcome input from dealers and collectors in specialized areas, to help insure my listings are complete and accurate. If the listing ends over the weekend, you will normally receive an invoice on Monday. An example of this would be undisclosed existing damage, like a chip or crack. An example would be if the measurements were slightly off. You will need to save the box and packing materials to show the shipper. This is the proof that they require, so if you discard the packing materials, your claim may be denied. Shippers do not accept parcels packed in damaged boxes as a rule, so damage is normally evidenced by damage to the box. The item "ANTIQUE JAPANESE OLD MEIJI PERIOD 3 LEG USUBATA CAST BRONZE IKEBANA VASE DRAGONS" is in sale since Tuesday, December 30, 2014. This item is in the category "Antiques\Asian Antiques\Japan\Vases". The seller is "finearts29mv" and is located in San Diego, California. This item can be shipped worldwide.